Planning a Farm / Barnyard Theme party and looking for resources? We have what you need and MORE! Click here for party supplies! 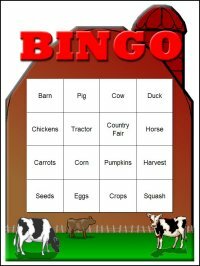 A COMPLETE DOWNLOADABLE Farm and Barnyard themed Bingo Game Set! Make a tractor cake for the John Deere party with a tractor cake pan, or you can build one with a few loaf pan -cakes. Put chocolate sandwich cookies on the sides for the tractor tires. Bowls of popcorn are great to set around the party and are fun to snack on. Plus they look GREAT in keeping with your farm theme! Chocolate haystacks are also fun to serve. You can make them yourself (the least expensive route) or they can also be purchased at your local chocolate store. BBQ your food if at all possible. Few things say farm cooking like cooking outdoors on an open fire! Plan on serving a wide range of vegetables and ask each of your guests to bring their own favorite veggie dip. This is great for everyone to get in on and youll find everyone will enjoy themselves tasting all the different tasty dips.